Featured in New & Noteworthy App Store Australia. Sent to his kennel for bad behaviour, Bouncer is left to dream about his favourite food in the whole wide world: ice cream. 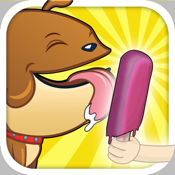 Help the hapless pup hop through his daydreams, avoiding baddies, picking up powerups and – above all – dining on delicious ice creams! - Share your score on Twitter and Facebook!